Tiger vs Nightmare review: A cute and relatable children's story for all ages – AiPT! ‘Tiger vs. Nightmare’ provides a great story that any growing child can understand. There seemed to be so many options for children’s books when I was younger. Ricard Scarry, Dr. Seuss, and The Berenstain (or Berenstein) Bears were just some of the seemingly endless supply books that were aimed at children. Children’s books still exist, but one of the costs of advancing technology is that YouTube has become a lot more popular than Where the Sidewalk Ends. After noticing my six year old godson spends an inordinate amount of time on tablets and cell phones I decided that it was time to introduce him to a new avenue of entertainment. 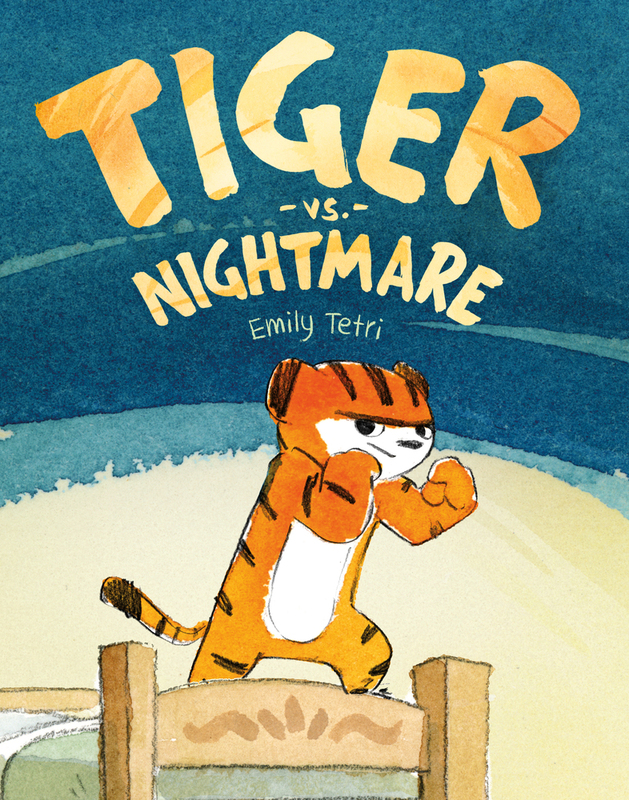 Thankfully, Tiger vs. Nightmare by Emily Tetri and published by First Second provides a great story that any growing child can understand. Tiger vs. Nightmare is about a young tiger who has a monster under his bed. This monster is different from your run-of-the-mill creatures as instead of scaring the young cub, Monster sits at the foot of Tiger’s bed while she sleeps and scares away her nightmares. One night, this becomes easier said than done, causing the two friends to work together in a way they never have. Tetri’s book is perfect for bedtime reading. Nightmares are a common problem for children and Tiger vs. Nightmare’s heartwarming story deals with the issue in a fun way that will have young ones engaged. The book accomplishes this on multiple levels. For example, the protagonist is a tiger. Tigers are normally depicted as ferocious beasts that can themselves be the stuff of nightmares. Here, we see the normally vicious predator in a vulnerable position. This succeeds in showing even the toughest of us can be scared when we go to sleep at night. Of course, Tiger vs. Nightmare would not work as well if the characters were not interesting. Tetri gives enough insight into the characters to explain their motivations. In particular, Monster is given an interesting backstory that will make perfect sense to any reader. Tiger tries her best to be brave, but she is still a cub. The writing gets this across perfectly and leads to a satisfying and logical conclusion. Tiger vs. Nightmare is a children’s book, but adults can also gain entertainment from its story. Nightmares do not go away as you get older (one can even make the argument that they get worse since they are more based in reality). On the surface, Tetri’s book is about a child dealing with nightmares. But older readers can appreciate the deeper layers. Is there a really a monster helping Tiger or is she dealing with her own fears? Hiding under the covers is a fine short term solution, but then what? An adult reader can even get a message about the power of imagination out of the book. Tetri’s art is a beautiful mix of pencils and watercolors. There are some wonderful scenes spanning two pages. The finale is a series of full page pictures that enhance the gravity of the climatic battle. The emotion in Tiger’s expression will impress children and adults and the manner in which she eats her food looks exactly like how a tiger with the ability to walk on two feet would snack. The nightmares are appropriately scary and youngsters will be showing off this book to everyone within earshot. Tiger vs. Nightmare is an uplifting children’s book that readers of all ages will enjoy. The art is an absolute joy to look at while the story will make kids sleep easier. Adults will also be able to enjoy its relatable tale. Children’s books do not hold the same sway that they used to, but Tiger vs. Nightmare gives young ones a reason to stop staring at YouTube. Tiger vs Nightmare accomplishes what all the best children's book do: it is a fun read for both kids and adults. It's a nitpick that has no bearing on the story, but I did not realize Tiger was a female until the cub was referred to as "she"